So, I spent a solid month earlier this year playing through every Halo game, reading Halo books, watching Halo movies, eating Halo cereal out of a Halo bowl with a Halo spoon… It was an experiment in getting caught up with 17 years of Deep Halo Lore, and I am still surprised by how much of the game’s story happens completely outside of the games but is mandatory if you want to have any sort of understanding of what is going on in them. It had the side effect of making me wonder what Bungie had been up to, and that lead me to wanting to pick up a copy of Destiny, a game I knew almost nothing about. That is to say, I had a vague understanding that there was a game called Destiny, and that it was sort of an MMO but Bungie really didn’t want to call it an MMO, and I sort of remembered drama around loot caves, but really it was just one of those games that came out in 2013-2014 when I wasn’t paying much attention to the state of the industry because the state of the industry was depressing. We did get Dark Souls II out of those two years, I guess, and a new Oneechanbara and a couple of good Miku rhythm games. And the Tomb Raider reboot, come to think of it. Oh, and Sakura Spirit came out in 2014. It wasn’t a particularly good game, even by the standards of “Are visual novels games?” but there’s an argument to be made that a mildly-pervy visual novel getting on to Steam and then blowing the heck up was one of the most impactful things to happen to Steam ever. Anyway, back to Destiny. I’ve mentioned that I am trying not to buy physical games these days, but it turns out that there is no way to buy Destiny digitally without buying “Destiny: The Collection”, which is sixty bucks. 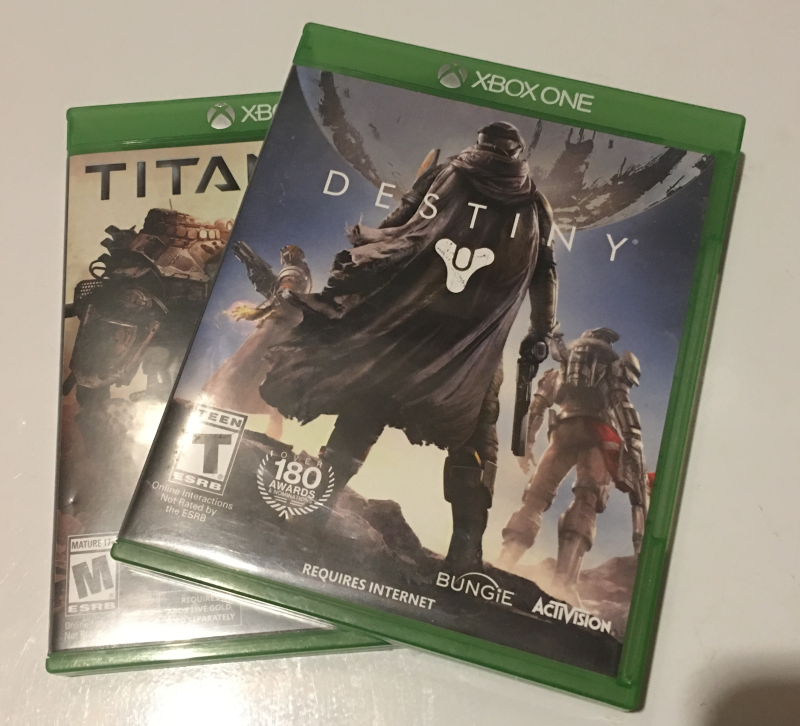 Copies of “Destiny” on disc, on the other hand, are widely available from Gamestop for $2.50, so I broke my no-physical-games rule just this once. OK, twice. Titanfall was also $2.50. I had played it for a bit on PC back in 2015, but I figured I might get $2.50 of fun from it. Now, both of these games are online-only affairs, years old, and replaced by their sequels, so I expected them to be absolute graveyards. The clerk at Gamestop even pointed this out while I was buying them, which I thought was a surprising bit of honesty. You will imagine my shock when I booted up Destiny, got through the introductory mission, and got dumped into the game’s hub to find it full of other players running around – and not just max-level players, either! I’m not sure what it looked like in the game’s heyday, but the impression I got was that there are a startling number of people still playing the vanilla game. The sense of life continued when I left the hub and went out into the game’s mission areas, where I just kept running in to people. I even got several group invitations, most of which I politely declined. On the other hand, when you get an invitation from someone with a gamer tag like this… how can you say no? Mr. R3ap3r and I wound up going through several of the game’s story missions together, and I must recommend the experience of playing Destiny with at least one other person. It makes the frequent “you’re locked in a room. Survive waves of enemies for a while until we open the door to the next room” encounters much more pleasant. I played for about 15 hours, finishing all of the story missions and doing side content, and that is a lot of fun to get for $2.50 from a bargain bin. There’s not much TO the story – I get the impression that the expansions fleshed it out a lot – but it ends with your character having saved the day and everyone says nice things about you for a little while. I also put in Titanfall for a bit, again expecting the title screen to be replaced with a picture of a tumbleweed rolling across an Arizona desert. I said a lot of nice things about Titanfall three years ago, so I won’t repeat them, but it’s still one of the best-feeling shooters out there, with the transition between ridiculously-agile pilot mode and deeply-satisfying stompy robot mode being just so… analog, and chunky, and I just don’t have good words for it. They should have sent a poet, I guess. Anyway, Titanfall is a little less-lively than Destiny, but there were still a couple hundred people playing the game’s “Attrition” mode (Look, guys, just call it Team Death Match, we know you want to), and getting into a match took less than a minute of watching the “finding game” wheel spin. I should also mention at this point that my normal play hours are from 1 AM to 4 AM US Pacific coast time since I work a very odd shift, and that is the worst possible time to find opponents in any online game. There were, however, no newbies here. I was dropped into a game as the sole level one in a sea of level 50s – and, moreover, level 50s who had gone through the 1 to 50 grind several times over and had exciting prestige emblems next to their names. My first match started with me loading in just in time to see “Victory!’ flash across my screen, and my second match went unexpectedly well – we won again and I actually had a positive K/D ratio. My third match, well… the game says I only died 15 times in the course of the match, but I think it may be being charitable and may not have counted all of them to spare my feelings. At that point, I was sitting at a 2-1 career record and figured I’d gotten my $2.50 worth and would just play through Titanfall 2’s single player campaign again if I wanted more giant stompy robot action. So, that was five bucks to find out what Bungie has been up to when they’re not making Halo games and to get used like a chew toy by Titanfall veterans. Well worth it. This entry was posted in videogames, Xbox One. Bookmark the permalink. I was gifted an old copy of Destiny recently and was also surprised by how active it still was considering the sequel had been released. It was enjoyable enough to play through the campaign.